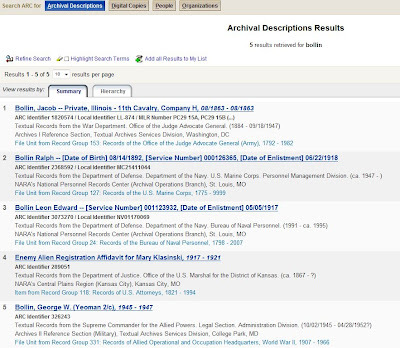 The National Archives (or more formally, the National Archives and Records Administration) has some wonderfully massive databases online, and I've covered the major NARA data sets -- military enlistement records, immigration/customs records -- in earlier posts. There's also a helpful summary at NARA in a section, What genealogical records are online? where you'll find some treasures like military criminal case files, lists of US Marshals, and fugitive slave case papers and petitions. But there's a section of NARA that is often overlooked...the Archival Research Catalog. ARC is the Archives' pointer system to their massive records holdings, the vast bulk of which are offline. But in putting together the database, NARA included millions of individual names...names that often come with snippets of interesting and valuable genealogical information. Almost all the family names that I searched on in ARC turned up some hits, even for some pretty rare surnames. Search on a common name like Davis, and you'll get 2,000 search results...the maximum the system allows. But even an unusual surname like Bollin turned up five hits. Four of these were military records spanning a period from 1863-1947. The fifth record was a 1917-1921 Enemy Alien Registration Affidavit (how often do you see one of those?) for Mary Klasinski. What's the connection between Ms. Klasinski and Bollin? Clicking on the record, and then clicking through the tabs (Details, Scope & Content, Archived Copies, and Hierarchy) tells us that Ms. K lived in Kickapoo, Kansas, was born in Missouri on June 18, 1858, and her maiden name was (go ahead, guess!)...Bollin. There's even a photo of Ms. K in the file that I can request from NARA -- the listing also provides contact information for the particular file in question. You might notice that ARC searches include a People tab, meant for searching individual names. You can try this, but I haven't found it to be particularly reliable, and prefer to stick with their just-search-everything default option. There is also a Digital Copies tab, for restricting your search results to digitized records that can be retrieved online. Run, don't walk, to the ARC search page to look for any of your ancestors who might be included here.